After a nourishing breakfast we will continue our descent to the valley floor, where we will cross the Apurimac River (1495 meters / 5000 feet). From here we will start to climb the long, steep trail (approximately five hours) to our destination: the impressive archaeological complex of Choquequirao, where we should arrive just in time to enjoy a breathtaking sunset over the deep canyon and the surrounding mountains (3000 meters / 9,900 feet). 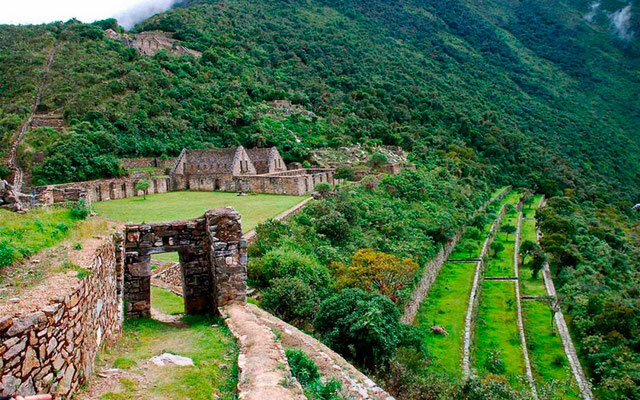 During the morning we will visit the restored section of Choquequirao and explore some of the ruins that are still covered by lush cloud forest vegetation. Much work has been done in recent years to excavate, clear and restore the site. After lunch, those who choose to can visit the Cascade House (restored buildings and terraces some 300 meters (1000 feet) below the main structures of Choquequirao). Later, our evening meal will consist of a typical Peruvian “pachamanca” (traditional Andean ingredients cooked in the earth). Volunteers to help with the preparation will be welcome! From the highest point of the archaeological site (the “usno”, or ceremonial platform) there are fine views of the Apurimac canyon far below, and if we are fortunate we may even see a great Andean condor soar above us. After breakfast and a last chance to explore independently the main structures of the archaeological site, it will be time to begin the long descent to the Apurimac River, where we will stop for lunch and a rest, before the three hour climb to our last camp at Cocamazana (2300 meters / 7,600 feet). On our last night together we will enjoy an excellent meal with spectacular views of Choquequirao and the Apurimac Canyon. In order to avoid the intense sun, we will start our day early with the climb up to Kapulyoq Pass (2800 meters / 9,250 feet), from where we will continue along a flat country road to the village of Cachora, arriving before noon. After a well-deserved rest we will say goodbye to the mule drivers and begin our return bus journey to Cusco. If there is time, along the way we will stop and visit Saywite, an enormous rock carved by the Incas into a 3-dimensional representation of their empire, complete with flora and fauna. We will arrive back in Cusco in time for a hot shower, before heading into town for a night out! Private transport Cusco-Cachora (roundtrip), bilingual guide, cook, mule drivers, mules for equipment and support saddle horses, camping equipment (double-, dining-, kitchen- and toilet tents, sleeping mats, etc), meals (4 breakfasts, 5 lunches, 4 dinners and snacks). Sleeping bag, meals not mentioned in the itinerary, extra services and tips.